The Bank of Canada’s (BoC) last meeting for 2018 may do little to influence the near-term outlook for USD/CAD as the central bank is widely anticipated to keep the benchmark interest rate at 1.75%. In turn, the Canadian dollar may face a bearish reaction if the BoC merely attempt to buy time at the December meeting, with USD/CAD at risk of retracing the decline from earlier this week especially as the Federal Reserve is widely expected to implement a rate-hike later this month. However, Governor Stephen Poloz & Co. may continue to prepare Canadian households and businesses for higher borrowing-costs as the ‘Governing Council agrees that the policy interest rate will need to rise to a neutral stance to achieve the inflation target,’ and a hawkish forward-guidance for monetary policy may boost the appeal of the Canadian dollar as the BoC sticks to its hiking-cycle. 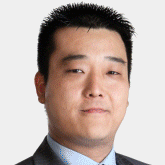 Sign up and join DailyFX Currency Analyst David Song LIVE for an opportunity to discuss potential trade setups! 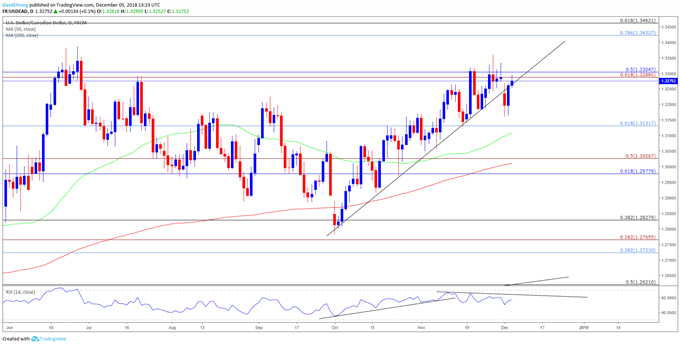 The Canadian dollar gained ground following the hawkish rate-hike, with USD/CAD quickly pulling back ahead of the 1.3100 region to end the day at 1.3056. Review the DailyFX Advanced Guide for Trading the News to learn our 8 step strategy. The advance from the October-low (1.2782) appears to have stalled ahead of the 2018-high (1.3386), with USD/CAD at risk of facing a near-term pullback as both price and the Relative Strength Index (RSI) snap the bullish formations during the same period. Lack of momentum to hold above the 1.3290 (61.8% expansion) to 1.3310 (50% retracement) region may spur a move back towards 1.3130 (61.8% retracement), with a break/close below the stated region opening up the next downside area of interest around 1.2980 (61.8% retracement) to 1.3030 (50% expansion).